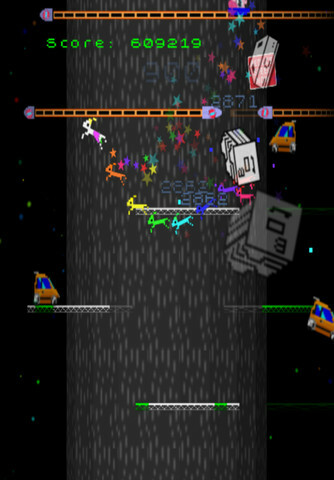 GoatUp is a fun arcade style 2D platformer app developed by Llamasoft and is available to download to the iPhone, iPod touch and the iPad for a price of $1.99. GoatUp allows the player to control a goat as they jump from one platform to another. 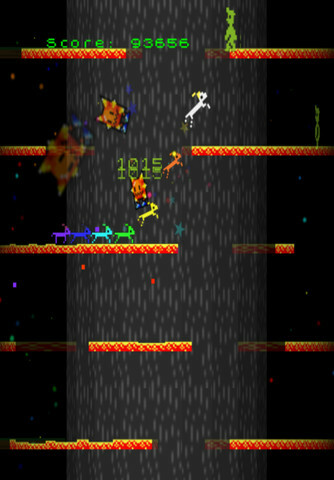 As the player progresses up the platforms, GoatUp will get increasingly difficult and various enemies will start to appear. Progressing further and defeating enemies scores points, and GoatUp will continue until the player loses all of their lives. GoatUp is a nice retro application that takes you back to the old arcade games (think Atari 2600) that were simple to play but impossible to master. GoatUp offers the player two different sets of controls to choose from when playing the app. You can choose between touch controls or tilt controls that are controlled by moving your phone or tablet. Both sets of controls work great, but the touch controls seem like that they are slightly easier to use. The motion controls can sometimes cause your goat to go where you did not attend them to go. When playing a game like this, the controls are the most important quality. Luckily, they hold up well and do not hinder the experience. The audio found in GoatUp does not add anything to the experience and are the weakest feature of the iPhone app . Anyone can have just as much fun playing GoatUp with the sound turned off or while listening to their favorite music. GoatUp is not a story driven app, so the lackluster audio is not that big of a problem. GoatUp is not one of the best applications available for the iPhone and iPad , but it does have a nice retro look. If you are looking to show off the graphics, then this is not the app for you. Gamers that enjoy playing retro games or are just looking to find something fun will love GoatUp. The graphics found in GoatUp have the same look and appeal of the old games found on the original Nintendo gaming system. The value of GoatUp is ultimately determined by how much you will play the app. At a price of just under 2 dollars, GoatUp is a cheap app but it is also fairly shallow. The gameplay found in GoatUp is the same every time you play with very little variance. This can lead to some people getting bored and never playing it again. If you do not mind the repetitive gameplay, then you enjoy GoatUp for a long time. GoatUp does not look or sound that great, but it still has a great retro appeal. The most important feature of GoatUp are the controls, and they are also the best aspect of the app. GoatUp is a solid iPhone app but the repetitiveness keeps its from achieving greatness. AppSafari review of GoatUp was written by Darius Reimm on September 29th, 2011 and categorized under App Store, Arcade, Featured, Fun, Games, Platformer. Page viewed 3431 times, 1 so far today. Need help on using these apps? Please read the Help Page.